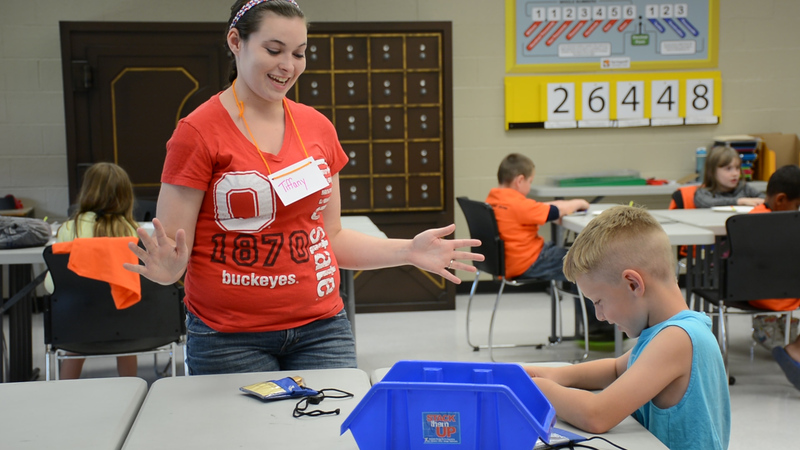 Stephanie Tilley, an Early Childhood Education major at The Ohio State University at Mansfield, helps a student with telling time at a summer Math Camp. Students busily measured Ladybug’s progress on giant sheets of paper as an elementary school teacher delivered the pre-planned lesson. Observers circled the room, making notes as the lesson progressed. The class was part of a well-orchestrated combination of teacher professional development and math camp conducted at Springmill Learning Center by The Ohio State University at Mansfield in July. The professional development class was made possible through a $203,000 grant from the Ohio Board of Regents. Twenty-two elementary and middle school teachers from the Mansfield City School District prepared and delivered lessons during the math camp. At the same time, camp teachers from several local school districts taught 170 children in the week-long camp, with relief from Ohio State Mansfield Education students. A similar camp was conducted with 60 children and 10 teachers at the Lucas School District in August. The grant includes a year’s worth of professional development with course credit through Ohio State. Elementary teachers attended a week of intensive coursework and designed lesson plans adapted from the Algebra Project’s 5-step curricular process, which evolved from Professor Lee McEwan’s successful Algebra Project high school program. Teachers then used the plan to teach during the camp, with other teachers silently observing. After the class, teachers discussed the interaction and offered feedback. Kelly Scott, an Ohio State Mansfield Middle School Education student and Mansfield graduate, helped develop games for the camp. Ohio State Mansfield and the Mansfield City Schools Board of Education have approved a plan to house a Math Literacy Initiative at the Springmill Learning Center. The center was on the closure list last spring when a plan was conceived to host professional development opportunities for elementary and middle school teachers in the facility. Ohio State Mansfield Professors Lee McEwan and Terri Bucci, in their fourth year of teaching professional development for the Mansfield school district, will serve as co-directors. Students from Ohio State Mansfield’s Middle Childhood Education program also are expected to receive field experience at the center. Posted by Christina Drain at 10:21pm Posted in Academics, Community, Faculty, Students/Campus Life. Bookmark the permalink.